"”O’er the Land of the Free and the Home of the Brave!" The Power of Ou" by Armeda C. Reitzel, Kyra Vollger et al. 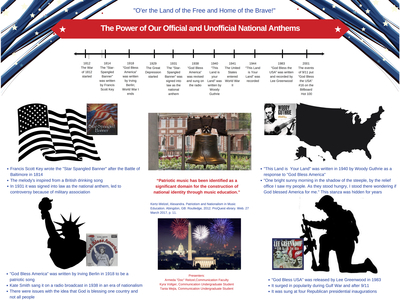 This study explores the historical origins and contemporary views of “The Star Spangled Banner” as the national anthem and three “unofficial anthems” in the United States. We define music as rhetoric and describe its role in promoting patriotism and fashioning identities. We conduct a rhetorical analysis of “The Star Spangled Banner” and discuss how it has become a rallying point - figuratively and literally - for first amendment rights by examining the wide array of actions and reactions to it. We describe the backstories of three unofficial national anthems and analyze how they have been transformed and appropriated by different groups and movements in the United States.